When 65-year-old Thomas Goebel walked into Texas Orthopedics to see Dr. David Savage, he was in excruciating hip pain. 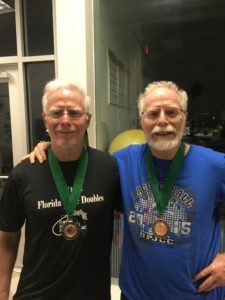 A few days earlier, he was aggressively practicing for a national racquetball tournament when he rotated the wrong way and felt a stabbing, throbbing pain in his right hip. After an exam, Dr. Savage explained that the forceful motion during practice had rotated his hip out of socket and then back in (ouch!). Dr. Savage suggested steroids for a few days and then they would re-evaluate. But Thomas needed to push up that timeline for the tournament. So Dr. Savage consulted with Physical Medicine and Rehabilitation specialist, Dr. Ai Mukai who was able to give Thomas a cortisone injection in his right hip a few days later. Between rest and the injection, he was able to get back to practice and compete in the tournament just one week later. And he not only competed, but he and his twin brother placed third in the 2019 NMRA National Championships. It’s the first time they’ve ‘medaled’ together at a tournament. Thomas and his brother are currently playing at the top national level for their age bracket. And now, Thomas tries not to overdo it so he doesn’t reinjure himself. He practices about 10 hours a week and is getting ready to compete again on April 6th at the Texas Senior Games Open in San Antonio. If all goes well there, he’ll advance to the nationals. We wish Thomas and his brother the best of luck! Thomas’ treatment is a compelling example of how our specialists collaborate and work together to get our patients back to doing what they love most. To make an appointment with one of our board-certified orthopedic surgeons or physical medicine and rehabilitation specialists in Austin, please visit us online anytime. Returning to School After Sports-Related Surgery Six Tips for Safe Skiing Cycling and Softer Bones? What’s the difference between Golfer’s Elbow and Tennis Elbow?